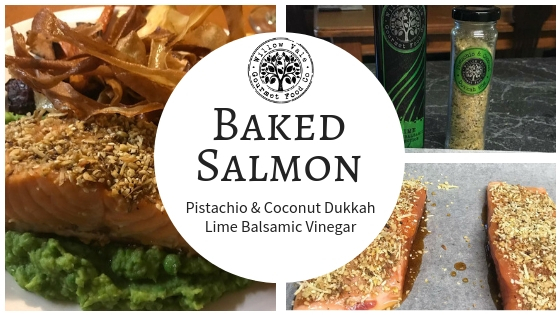 Baked Salmon Fillets with Lime Balsamic and Pistachio and Coconut Dukkah | Willow Vale Gourmet Food Co. Sit the Salmon on a tray lined with baking paper. Sprinkle Salmon with a little Sea Salt. Press a layer of the Willow Vale Pistachio and Coconut Dukkah – over the top of the Salmon. Salmon is better if a little under cooked. We love to talk to customers and potential wholesalers. Please phone us on 0433 593 293 to discuss any opportunities or feel free to submit this enquiry form. Welcome to Willow Vale Gourmet Food Co.
At Willow Vale Gourmet Food Co. we are committed to tantalising your tastebuds with our all-natural and hand crafted selection of gourmet food accompaniments.